Put a large pot of salted, boiling water on the stove. Follow the instructions on the box for the cooking time. Drain in a colander and return to the pot. Keep warm. Add the asparagus pieces to a small amount of water and boil for 1 minute. Immediately drain and submerge into an ice bath to stop the cooking process. Set aside. In a large frying pan, add 2 tablespoons of olive oil, onion, and peppers. Saute over medium high heat for 5 minutes. Add the sliced mushrooms to the pan with the onions and peppers and cook for an additional 2-3 minutes. Remove the onions, peppers, and mushrooms from the pan and set aside. In the same large frying pan, add 2 tablespoons olive oil and 4 tablespoons butter, and the minced garlic. Cook over medium low heat for 2 minutes. Add all the cooked vegetables to the pan, mix together and season with salt, pepper, and seasoning salt, as desired. 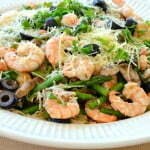 Place the cooked pasta in the bottom of a large serving bowl and add the shrimp mixture, including all the pan juices. Top with black olives, freshly grated Parmesan cheese, and chopped parsley. Place additional freshly, grated Parmesan cheese on the table, if desired. Makes great, warmed up leftovers!